Pictured is the Hunts & Peterborough Under 14 team that played Buckinghamshire yesterday. In the team were Borough players Junior Little, Harry Missin and George Neale. The sun shone on Peterborough Rugby Club’s junior sction yesterday (October 21) with a number of big victories. 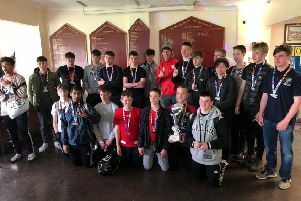 The Under 14s romped to a 72-0 away win over Peterborough Lions, despite having three players away on county duty, to keep hold of the ‘Derby Cup’ which is awarded every time the two neighbours play. It means Borough have held the trophy ever since the two sets of players were Under 9s. Luke Farley, Rowan Forbes, Lucas Niklasson and Kane Powell had two tries apiece with four other players touching down, while Pat Blackman and Charlie Roberts kicked two conversions each as well as getting tries. The Under 13 girls’ team also went on the rampage, returning home from the Coventry-based Barker Butts club with a 65-15 win to their credit. Eight different players scored tries, with Lucy Dangerfield leading the way with four, while Molly Rain and captain Nyahleh Soyei added two apiece. The Under 15 girls were also away at Barker Butts and won a hard-fought game 19-10, despite having two of their top four scorers missing. Jorja Matchwick had two tries with Jess Moorfoot scoring the other. It was not such good news for the Under 16 boys’ team, who had another tough match, going down 36-15 away at Sleaford, a result that didn’t reflect their forwards’ dominance. Ryan Akiler-Bates, Harry Hudson and Matt Wakeham scored the tries. Back at Fengate, the younger age groups all played Kesteven. The Under 12s enjoyed a 25-5 win thanks to two tries from Lewis Feeke and one apiece from Riley Kitchen, Daniel Roche and Jack Warrington. “It was a great team performance, with Kesteven offering the most physical game we’ve played so far this season,” said coach Jonathan Kirkman. Six of the Borough Under 15 boys team played for Hunts and Peterborough as part of the Northampton Saints Developing Player Programme at Stowe School. Ethan Manning and Taylor Shortland started all three games and William Manning, Josh Webster, Jacob Gent and Leon Tulip also played. Unfortunately results did not go Hunts’ way as they lost 15-10 to Suffolk, Shortland scoring a try, drew 10 all with East Northants and lost 35-0 to Cambridgeshire.